Garter Day was yesterday, and the Queen, Duke of Edinburgh, Prince Charles, Prince William, Prince Andrew, Prince Edward, Princess Anne, Kate Middleton, Duchess of Cambridge and Sophie, Countess of Wessex all came out for the Order of the Garter ceremony/procession at Windsor Castle. Kate and Sophie were spectators. The others are actually in the Order. Camilla, Duchess of Cornwall was due to attend, but she had sinusitis and stayed home (Get well soon, Camilla). The Countess of Wessex has been getting a lot of coverage lately—which is awesome. Yesterday, Sophie visited Frimley Park Hospital where she nearly died giving birth to Lady Louise in 2003. Sophie suffered a placental abruption at 36 weeks which caused her to lose a lot of blood. Marcus Setchell delivered her via an emergency cesarean one month early. Lady Louise was taken to St George’s Hospital’s neonatal unit in London for two weeks. Sophie was at the hospital to open the new neonatal unit. It was the first time she had been back since she gave birth to her son, James, Viscount Severn, in 2007. The unit was funded by the Frimley Park Hospital Charity’s Saving Tiny Lives Appeal. The Countess of Wessex was out and about yesterday (March 11), visiting the England hockey team at Bisham Abbey National Sports Center in her role as Patron of England Hockey—she’s been patron since January 2007. Sophie talked to the staff and players and got in on the action by playing a bit with player Shona McCallin. From the pictures, Sophie seemed to really be enjoying herself, which is great to see. She was presented with an England Hockey jersey. The men and women’s England hockey teams will compete in the Hockey World Cup in the Netherlands in June and in the Commonwealth Games in Scotland in August. 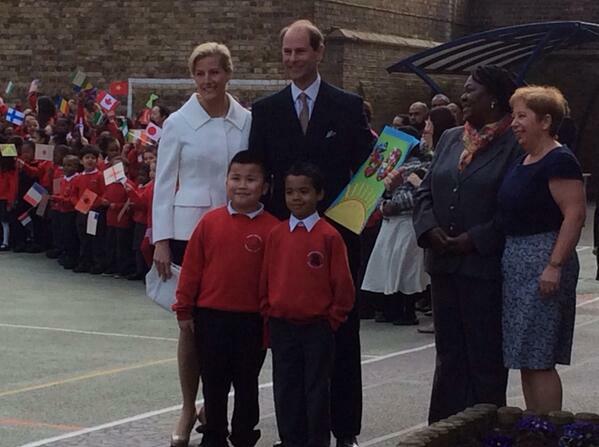 To celebrate his 50th birthday Prince Edward and Sophie, Countess of Wessex visited Robert Browning primary school in Walworth, London to observe work being carried out by Kidspace, a charity preventing childhood bullying, who received money from the Wessex Youth Trust. The Wessex Youth Trust is a charity set up in 1999, after the Wessex wedding, that has granted £1.3 million to 154 charities since it’s inception. Edward and Sophie took a private jet on holiday: scandal or no big deal? Call Olivia Pope, y’all, it’s the Edward and Sophie private plane SCANDAL! Lol, just kidding. But this article is trying to make it a big deal. It even compares Edward and Sophie to William and Kate and says how great Will and Kate are because they took a budget airline the last time they went skiing and Edward and Sophie hired a private jet to take their family on vacation to Switzerland. Today is a heavy post day. Sorry to flood, but there are multiple things I would like to cover. Not all of them are super long, though. Some (most?) are quick check-ins.